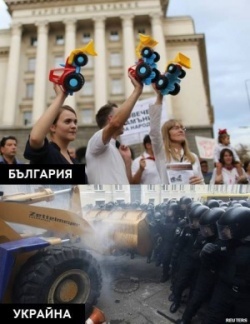 A combo picture shows Bulgarian protesters waving toy bulldozers at an anti-governmental rally in Sofia vs Kiev protesters charging the riot police with a bulldozer. This Sunday the demonstrators pulled down and decapitated the statue of Lenin in central Kiev. These are just some of the breaking news headlines coming from Kiev the days. This is what I call a revolution or at least a revolution in the making. I don't believe in the so-called 'tender revolutions'. They have been devised to replace the real revolution and mislead ordinary people that something is happening, changing. It takes some blood shedding to bring a country to the brink of revolution – it has been like that for ages and it will be like that in the future, no matter whether we like it or not. But, please, don't take this as a call for violence or new wave of protests. Truth is, Bulgaria has never experienced a real revolution. Bulgaria has experienced only “tender” revolutions and it is a small wonder that we are facing “tough” problems. No matter how different opinions of Bulgaria's summer protests are, there is one attribute nobody can deny them – creative. The protests are a real achievement of a flash mob expression, the problem is that never has a government been toppled with art performances, but with fighting. That's the truth, for good or bad. There are numerous examples of that – Ukraine, Libya, Egypt. It is a matter of a different point of view whether Bulgaria's protesters have a just cause or not, but nobody can deny that after so many days of rallying the protesters look like bleating sheep in front of the closed gates of those in power. The prime minister is free to come and go whenever he wants – true, through the back door, but it is ok with him, as he himself once said. Are Bulgaria's protests infected by fear or fatigue? Which takes the upper hand? It is difficult to answer that question, may be protesters are both full of fear and fatigue. At the same time some old wise men are complaining that as a nation Bulgarians are divided. The problem is not that we are divided. It is good that we are different and have different opinions. The problem is that we are artistic when we have to be serious and serious when we have to be artistic and have fun!